What is the Tamarack Prolific Breed? The Tamarack Prolific was created by Janet McNally in 1987 to fulfill the need for a well-muscled, easy care sheep that would thrive and be profitable in the farm flock pasture environment of the Midwestern and Eastern US. The Tamarack Prolific began with the introduction of the Booroola B gene for prolificacy into the polled Dorset. The resulting cross was then back-crossed for many generations to polled Dorset and Ile de France rams to improve milk, growth, number of lambs weaned, and carcass quality. Selection using estimated breeding values (EBV’s) further improved maternal weaning weight (milk), weaning weight, post weaning weight, loin eye muscle depth, and numbers of lambs born and weaned. Rigorous culling produced a sheep requiring less labor with significantly higher lamb survival. 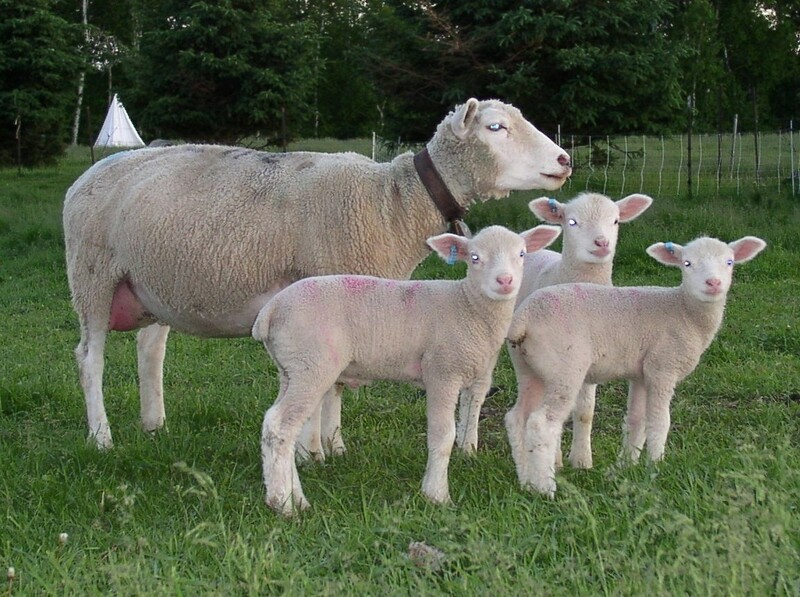 The Tamarack Prolific ewe not only has the ability to birth and rear large litters of lambs, but will produce a quality market lamb that is killable at a wide range of weights from 30 lbs to 120 lbs. Early lamb growth is high with top individuals gaining more than a pound a day on good grazing for the first 100 days. Ewes weigh 140 lbs to 225 lbs with an average of 165 lbs. Tamarack Prolific ewes have excellent mothering skills and will wean from 237% to 320% lamb crop on a principally forage-based diet. The Tamarack Prolific ewe enjoys a long breeding season and accelerated or out of season lambing is possible. Tamarack Prolific rams show exceptional fertility and libido, often settling the flock in less than 21 days, yet are docile around their handlers. Rams weight 180 lbs to 280 lbs with an average of 225 lbs in pasture condition. 1) The animal must have DNA on file with AgResearchnz confirming at least on copy of the Booroola gene. 2) The animal must be enrolled in Lambplan and have recorded as a minimum, 100 and 150 day weights with birth and pedigree information and make this information available for across flock evaluation. 3) The animal must have valid genetic links to the original Tamarack Flock. Lambplan is a genetic evaluation tool that calculates estimated breeding values. These two modern services replace the need for a breed registry as DNA as the ultimate proof of who an animal is, and Lambplan provides a way to keep track of pedigrees and provides the tools for genetic improvement. These requirements are paramount to assuring the Tamarack Prolific continues to stand out as a profitable sheep for pasture-based flocks.